Tips on Designing A Perfect Nursery! | 41 Lumber - Serving Iron Mountain and the U.P. Tips on Designing A Perfect Nursery! If you’re expecting a new addition to your family, then there’s already a long list of things that need to be done. One of which is the nursery. Nine months might seem like a lot of time, but as you’ll soon see, it a goes by all too quickly. To make this busy time a little bit easier, we’ve included some tips to help design the perfect nursery. Like most things, it all starts with good planning. Start with the most practical things first. Do you have a choice of where to locate the nursery? If possible, choose a room that is reasonably quiet and a close distance to your bedroom. Once a room has been determined, there are other factors to consider. Is the room generally warm or cold? You may need to take appropriate measures to provide supplementary cooling/heating to keep the room comfortable for your new arrival. If the room has a lot of windows, consider blackout blinds or curtains to keep the room dark, thus reducing distractions during sleep time. When the time comes to select the furnishings for your nursery, pick out the key pieces first. By doing this, you’ll be able to more easily decide on a color scheme when it comes time to paint and paper. Also, you’ll have a better idea of how much extra room you’ll have in the nursery once you have the necessities in place. When choosing a color scheme, try to go with tranquil colors. You’ll want a soothing, calm environment for your baby, without loud distracting colors when nap time comes. What kind of lighting is already in the room? You’ll find that lighting comes into play throughout the life of your nursery. A dimmer can provide soft lighting in the evening and can serve as a nightlight when necessary. Babies come with a lot of stuff. Therefore, it’s best to consider your storage options as you plan your nursery. There are a lot of customizable storage solutions to make the most of the closet space that you have. In addition, tastefully done shelving that incorporates baskets for additional storage can come in handy. Consider this room’s future. 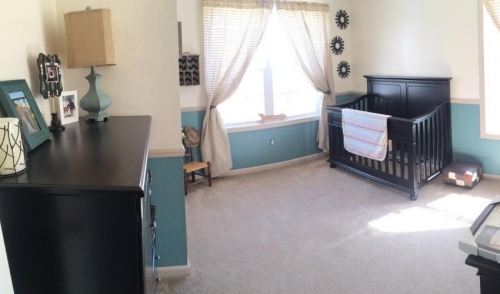 Obviously, it won’t always be a nursery. By using neutral background colors and swapping out accessories for decorating (such as paintings/pictures) as your child develops, it will reduce the amount of work needed as you redecorate over time.